At the end of the article, we mentioned our new self-service monitoring system. At PlanetHoster, we have always tried to be transparent with our clients. We aim to communicate honestly about our infrastructure at all times. What’s more, clients have always been able to express themselves openly on the PlanetHoster forum, read updates on our blog and submit new development ideas via our suggestion features platform. If you suspect at any time that your website, server or application is down, you can take a look at our monitoring service to check the status. Your ping: A ping test will check the availability of the network host. If a problem has occurred, there will be packet loss. SSH service: SSH provides a secure connection to the server to execute commands. Web service: Web services (Apache, Litespeed, Nginx, etc.) make the website or web application content visible. CPU load: Time it takes for the CPU server to run processes. For example, the shorter the service time (IOwait), the faster your website will run. General load: The web hosting server’s general load. MySQL service: Service providing database management for your website or mobile application. This service provides information on the path between our edge routers and the desired destination. Looking Glass can also determine the latency required to transmit data and compare the quality of our services with other service providers. MTR: Software combining traceroute and ping data to provide an overview of the network between our routers and the final destination of the transmitted data. Traceroute: Displays the network equipment between our routers and the data’s destination. Ping: Time required for a unit of data (packet) to travel from our routers to the destination computer. All serious web hosts (interesting article: Serious host? How to check?) offering quality services, must have network redundancy. Network traffic must have access to many paths to ensure that data reaches its destination. Afterward, latency optimization is an option. Optimization is achieved using software that calculates the best possible path. The following section lists all PlanetHoster’s Internet service providers. If one of them is undergoing maintenance, its status will update automatically to inform you of the situation. What improvements are planned for the PlanetHoster monitoring system? We are currently developing a mobile notification system that will alert you when there’s an issue with your website or web application. For example, you will be informed if you have an unpaid bill, domain names to be renewed, etc. You will also be able to customize your alerts. Do you have any external surveillance services to recommend (i.e. other than PlanetHoster)? Below are two popular website surveillance tools. 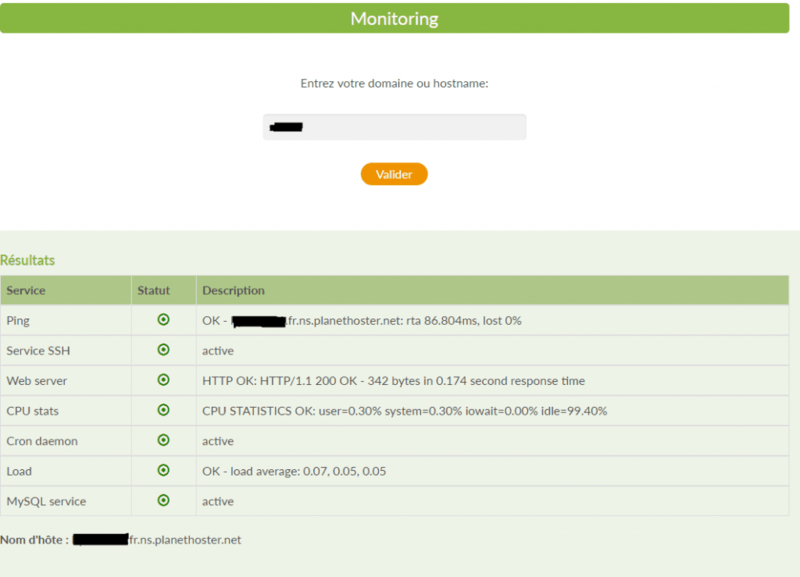 You may receive false positives if the suppliers’ IPs are blocked by PlanetHoster’s firewalls.